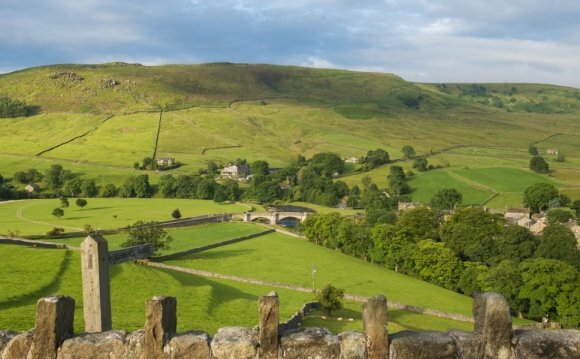 The Yorkshire Dales is famous for its stone walls crossing the landscape, the green of this limestone country contrasting with amazing scenic features such as Kilnsey Crag or Malham Cove. Each Dale has its own character, with famous rivers such as the Wharfe or Swale flowing along the valley bottom, hardy sheep grazing the uplands, and stone-built farms and villages dotting the landscape. Curlews, oystercatchers and birds of prey can often be seen. The Yorkshire Dales is prime walking country, with gentle walks throughout, and more taxing walks in the Three Peaks area of Penyghent, Whernside and Ingleborough. Underground, visit caves at White Scar and Stump Cross, or the experienced caver can explore miles of passages. Towns such as Skipton, Leyburn, Hawes and Richmond offer fascinating shops and interesting diversions, with markets and local produce available. Throughout the Dales there are reminders of its turbulent history - Viking place names and fortresses such as Bolton Castle and Skipton Castle. More modern attractions such as the Forbidden Corner or Wensleydale Cheese Creamery offer different experiences. In the Yorkshire Dales there is holiday accommodation to suit all requirements - cosy cottages, welcoming bed and breakfasts and guest houses, hotels and inns in town and country. Good Yorkshire hospitality will add to the pleasure of your stay.